I run a small local book festival. Its original purpose was to help promote all of our local literary talent because there are a lot of us. It grew into that, plus promoting overall literacy and supporting community in all of four years. 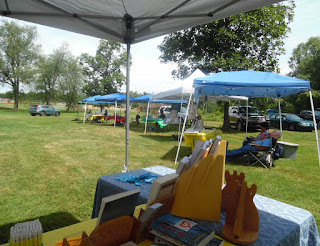 This month was year four for the West PA Book Festival. Any idea how much planning time, detail, funds, and stress it takes to bring in 20-some authors, do all of the promo for it to include newspaper press releases and radio ads, plus road signs (by hand to save costs)? A lot. Months. We even had a food truck, hoagies from the Legion Auxiliary, and music was planned (cancelled on us last minute). Set up and tear down, since it's outdoor and we use tents and a pavilion where we have to move tables out and back in, takes nearly two hours before and after the 6 hour event. Our first year, turnout was wonderful. This year... Let's just say it was disappointing, with as well advertised as we were. People knew about it. They simply didn't bother to even walk around and see who was there and what kinds of books they might be interested in. Over the next couple of days, my biggest thought was wondering what wasn't done well enough. And then I found another author's post on Facebook saying she was possibly throwing in the writing towel. Why? Because the money has disappeared. I commented about the low festival turnout, and this author who has done many of these events around the country said book signing turnouts everywhere have dropped to nothing. Along with that, online sales have dropped to almost nothing. She's hardly the first author I've seen say the same. So, it's not a planning issue. It's a supply and demand issue. The problem: Amazon is absolutely flooded with free and $0.99 cent novels. Not excerpts. Not short stories. Full novels, given away by the thousands from many, many authors in the name of promotion and with hopes that readers will love the "first of series" and go back and buy the rest at regular price (generally between $2.99 and $4.99 of which the author gets either 30% or 70%, and if they choose 70%, they have no option to keep it from being loaned out for no further compensation). Sometimes that does happen. Yes. A few years ago, some authors were making decent money this way. By now that has crashed. Why? Readers have hundreds of free books downloaded, many of which they'll never even bother to read, or they pay for that monthly service to download as many as they wish without paying for any individual book. There's also the issue of returns. Yes, readers are allowed to read and return, taking ALL compensation away from the author. Why buy a book when every day more are being posted free? Why go out and buy a paperback, even a signed paperback, when you can sit at home and download more books than you'll ever have time to read at no cost, or almost no cost? Who can blame readers? I certainly don't. We authors have done this to ourselves. For years, I've urged authors to please not give their work away free or next to free. We're undervaluing ourselves, teaching readers that our work is just for fun and we don't need to be paid for it. So now authors are quitting. Writing a novel is not play. It's work. It's a whole heck of a lot of work for those of us spending months or years on a story that's a part of us. It costs a lot of time, energy, emotional stress, advertising costs, production costs (not all authors pay production costs, but some of us do), not to mention the things we have to put aside to be able to find the time to do this. It's not spare time. It's valuable personal and business time. Just like with any career, it matters. Yes, big author names will still sell paperbacks and hardbacks, and even e-books at $10-15 while indies are nearly giving them away at $3-5 (or worse). Big pubs don't give books away, more than a handful of prints for select reviewers. They know better than to kill their own market. It's time we indies take a hint. Supply and demand. Stop flooding the market with undervalued books. We must start respecting our work if we want readers to respect our work and our time. At this point, it's going to take some doing to undo what's been done, but at this point, it's either change tactics, quit, or write as a hobby and not expect to make anything. Readers, I fully understand appreciating free books. I do. I peruse bargain bins for lit fic by authors I haven't read. When I find what I like, though, I buy other books as they come out, at regular price, because I want them to keep writing. I don't want them to quit. A good book is worth far more than a fast food meal (equivalent cost of a paperback) or expensive cup of coffee (equivalent cost of an e-book). Or even request their books from your library. Most of us are available in print, e-book, and through the library. It's still free to you if you go through the library, but it helps us. If you value books and good stories, please, consider bypassing some of the freebies and support authors you enjoy. Go to book signings and festivals. Even if you don't buy, pick up their promo and check them out online. But let them know they matter. Before they stop bothering. There will be a 5th Annual West PA Book Festival because I don't give up easily. I believe in books, print books in particular (there is a difference in your brain between reading electronically and reading in print), and in supporting authors. I believe in trying to teach kids that books matter, literacy matters. They do far better in every school subject when they read regularly than when they don't. Obviously, reading matters. Myself, I'm not about to quit because the money's not there. That's not why I started writing and I've never depended on it to pay bills (luckily!). I do find it sad to see so many authors throwing up their hands even when they have a lot of followers. There's something just wrong about that. It's time to seriously rethink the book business and acknowledge books and authors as the value they are to society. Unless plumbers and carpenters and lawyers are going to start working for free, we shouldn't be doing that, either. Hello and thanks for stopping in! 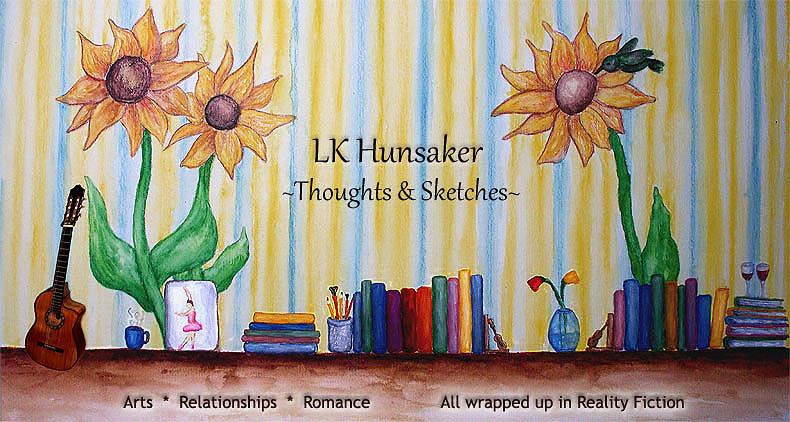 I write literary romance and mainstream fiction with romantic elements under LK Hunsaker, along with art journals for my Write the Light In project, and some children's fiction. Under Ella M. Kaye, I write contemporary literary fiction with a mental twist. I'm also an artist and I incorporate the arts in all of my work under both names. Check out my Book Boards!